Commoner, B, PW Bartlett, E Holger and K Couchot. 2000. Long-range air transport of dioxin from North American sources to ecologically vulnerable receptors in Nunavut, Arctic Canada. Final report to the North American Commission for Environmental Cooperation. September, 2000. Implications of their work: Commoner et al. have discovered that a relatively small number of sources contribute a disproportionately large percentage of dioxin being deposited this Arctic territory. Their results suggests that a focused effort on these sources could reduce exposures dramatically. Citing one example (Coral Harbour, Nunavut), they observe that "total exposure to dioxin could be reduced by 35 percent if only 19 individual source--most of them in the United States--could be induced to virtually eliminate their emissions." Background: Nunavut lies in the far north of Canada. Even though there are no significant sources of dioxin there nor elsewhere within 500 kilometers of this arctic territory's boundary, dioxin concentrations in the breast milk of Inuit mothers living in Nunavut average twice the levels observed further south in Canada, near the US border. Nothing exemplifies the ubiquitous spread of persistent bioaccumulative compounds better than this example. What did they do? Commoner et al. set out to identify sources of dioxin that might be contributing to high contamination levels in Nunavut. They did so using computer modeling procedures that Commoner and his lab had developed for other contaminants within the US, building on an air transport computer simulation model originally developed by the US National Oceanic and Atmospheric Administration (NOAA). What did they find? They found that most of the sources of dioxin reaching the territory Nunavut lie in the United States, indeed approximately 70-80% is US-produced. Another 5-10% comes from Mexico while 11-25% come from Canada. Contributions at specific places within Nunavut vary from place to place within the territory. Negligible amounts (less than 1%) originate in Nunavut, itself. Thus "the exposure of the Nunavut exposure is therefore almost entirely due to outside sources." This map shows the highest-ranked individual sources of dioxin that account for 35% of total dioxin deposition in the vicinity of Arctic Bay, Nunavut. Many other sources contributed smaller amounts. The map is representative of many such "source-sink" maps produced in their analysis. Adapted from Commoner et al. 2000.
a relatively small number of sources are responsible for most of the depositions. For example, at one typical site studied, only 19 sources are responsible for 35 percent of the deposition. Those 19 sources represent 0.04% of the total sources studied. just 3 types of sources--municipal waste incinerators, backyard trash burning and cement kilns burning hazardous waste--account for two-thirds of the total dioxin emissions, and 6 types account for 90%. Most of the sources are at least 3000 km (1800 mi) from Nunavut. 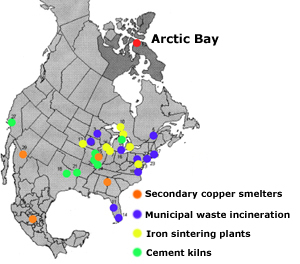 They conclude that "the known occurrence of dioxin in Nunavut--in the indigenous population, in the regional food chains, and in marine and terrestrial ecosystems--is due to the deposition of dioxin transported from distant sources, which are chiefly in the United States, to a lesser extent in Canada, and marginally in Mexico. In discussing the implications of their work, Commoner et al. observe that there is no feasible way to protect food chains from the deposition of airborne dioxin. This means that protecting Inuit health requires either a reduction in emissions or a change in diet. Such a change would "clash with the transcendent importance of the indigenous diet in Inuit culture."